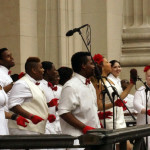 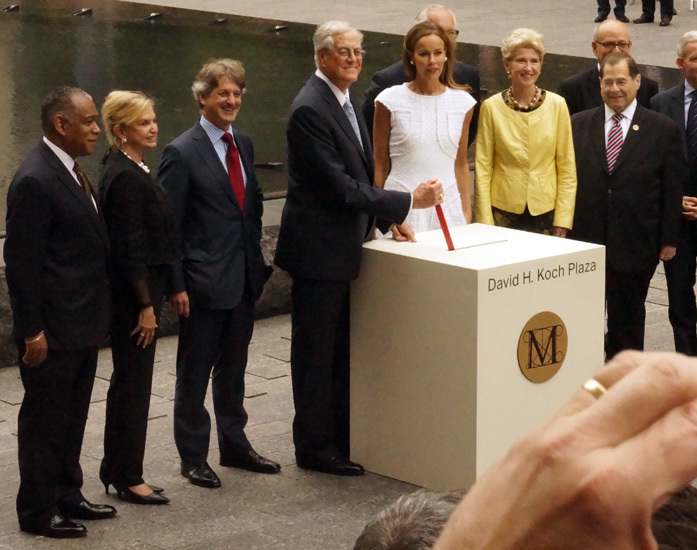 A dramatically redesigned plaza in front of the Metropolitan Museum of Art on Fifth Avenue was dedicated today and named in honor of its sole donor, David H. Koch. 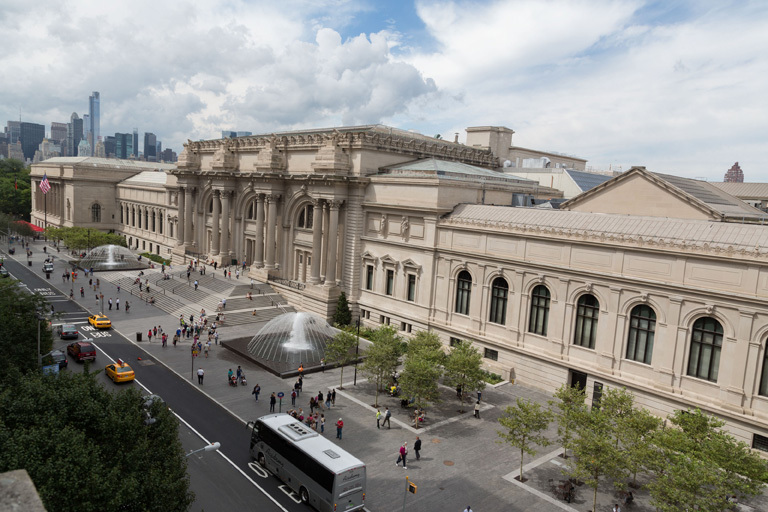 The four-block long plaza, which flanks the museum’s famous entrance steps, includes two fountains, alleys of trees, new paving and red, angular canopies/parasols over seating benches. 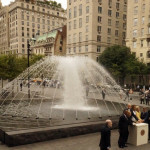 Mr. Koch, who attended the ceremony with his wife, Julia, and three children, said that the plaza “became a passion for me.” He had lived nearby when it was under discussion and he said he hoped it will last for 50 years until a future philanthropist funds another renovation. 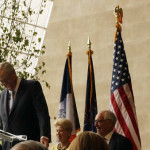 Mr. Koch received a very, very long standing ovation from the many museum and government officials and members of the press attending the ceremony. 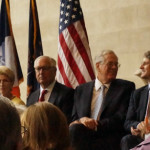 Mr. Brodsky opened the ceremony by describing Mr. Koch as having “an eye for beauty and a heart for civic improvement, truly a great philanthropist,” while Congressman Carolyn Maloney said that it was “a sign of hope” that she and Mr. Koch could share a podium, which elicited much laughter from the crowd because of her interest in liberal causes and Mr. Koch’s conservative stance. 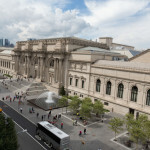 The previous plaza required the controversial removal of many elm trees by Thomas P. F. Hoving, then the museum’s director, but this renovation went very smoothly as community groups and the Central Park Conservancy noted that it was doubling the number of trees on the plaza to 106 and planning to relocate many. 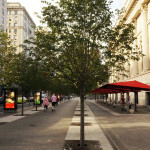 OLIN, the landscape architecture, planning, and urban design practice, was the lead design consultant for the project, which used London Plane and Little Leaf Linden trees. 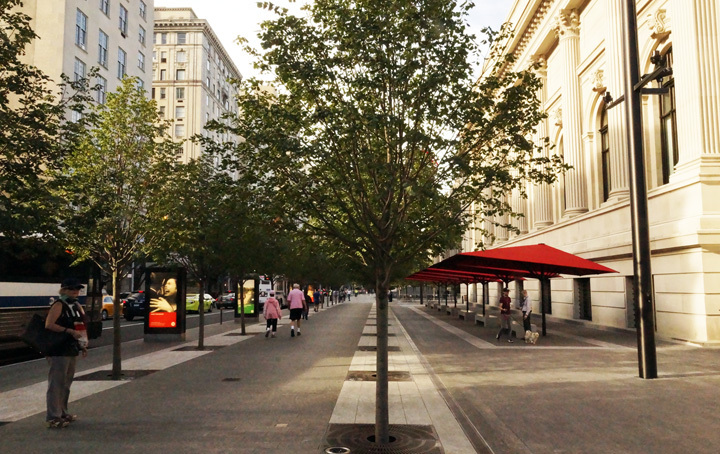 The elegant new plaza has 30 tables and 120 chairs that users can arrange as they please. 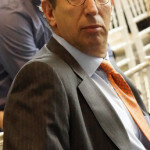 Among those also in attendance were Congressman Jerrold Nadler, Councilman Dan Garodnick, Robert I. Shapiro of City Center Real Estate Inc., William Judson, the retail real estate broker, and William Rudin, the developer.